An obscure Polish black metal band with a name that sounds like someone clearing their throat (it means ‘fog’) isn’t exactly the obvious next candidate for underground success. And indeed, Mgła are a name known to a select few – it was actually Swedish death heroes Canopy’s vocalist, Fredrik Huldtgren, who introduced me to the band via the MR forum many moons ago (*tips hat*) and to my shame I’ve only just now gotten around to reviewing them. A side project of two members of Kriegsmachine, Mgła have released just one full-length in eleven years of existence, split into four numbered tracks, two over seven minutes, two over ten minutes. In terms of sound, there are many hints from across the black palette, yet old-school Satyricon is the most obvious touchstone, from the diverse drums to the broad and atmospheric riffing. 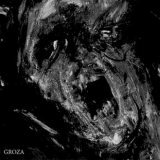 It’s still quite different to Satyr and chum, though, and Never less than mournful, yet never without a touch of anger, Mgła are capable of creating atmosphere with ease, relying on riffs and song structure to please and punish the listener. Interestingly, it’s hard to get a real understanding of this album. It starts with what sounds like a fairly clean, modern production, and together with the repetition of key melodies in the first track suggests that Mgła have set their sights higher than ‘mere’ basement noise. Yet by the time you’ve reached the rawer IV, you’ll be in no doubt as to the band’s underground sound, a smooth transition having taken place before your very ears, drawing you in with skill. That skill is repeated all over Groza (‘the horror’). Drums are rarely content to merely blastbeat, moving from one pattern to another as often as the guitars change riffs, always moving like rats beneath a floorboard. Vocals are set slightly back in the production allowing the guitar to dominate the sound, and fortunately for us M is a skilled player, taking us from the proverbial dark woods to more modern settings and back without pushing listener credulity or – again – really making you notice the transition. These elements come together best in the songwriting. I’ve already mentioned the melodically-tinged I, but the mere contrast with the dark and foreboding II is quite different to most band’s uniform grimness. Of course, less is more, as ever. A misleading initial step towards groovier terrain in III, with softly epic melodies, soon turns towards rambunctious speed with wonderfully organic-sounding percussion – something you miss after not listening to black metal for a while! To close proceedings, IV starts raw but ends with a return to the melody (not the same melody, however) of the opening track, completing the circle. It would be perfect music to close your eyes and space out to were it not for the restless drums, which seize your attention and force your eyes open every time. The album’s not perfect – there’s no real reason the tracks couldn’t have been cut down a little, as this would have made an even better EP than the short album it is. It’s a pretty harsh criticism, I admit; at no point do the tracks outstay their welcome, despite the lengths. As that abstract artwork suggests, this band have a real depth and breadth to a sound that is all too often sadly two-dimensional. Black metal that draws you in easily and lets you go reluctantly, that mixes melody and grimness, that wields melancholy like a weapon without overtipping its hand? Sign me up – wherever Mgła’s musical journey takes them next, you can be sure that I won’t wait three years to share it.